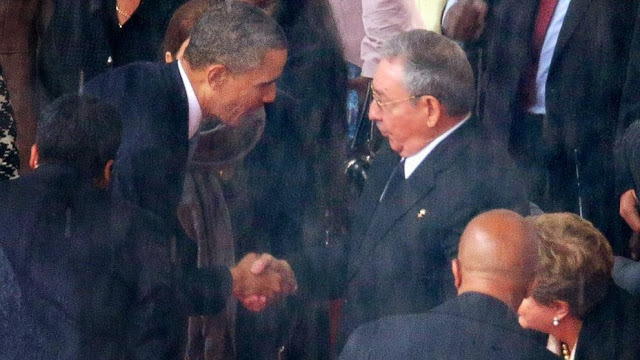 US President Barak Obama yesterday (10 December 2013) shook hands with Cuban leader Raul Castro. Appropriately this gesture of friendship took place during the memorial service held for former South African president Nelson Rolihlahla Mandela at the FNB stadium in Johannesburg, South Africa. How fitting this gesture was at this time. Nelson Mandela became a world symbol for peace and reconciliation after his release from 27 years as a political prisoner under the old apartheid government of South. On his release Mandela, known to the world as Madiba, extended the hand of reconciliation to his former enemies. Mandela believed in freedom and equality for all people, regardless of race, creed or gender. During the time leading up to South Africa's first free election, and his subsequent term as the first president of a democratic South Africa, Madiba was instrumental in saving Saving Africa from a bloody and destructive civil war. It was therefore appropriate this significant event took place in a place and time when the world mourns the passing of this great leader. It's about time the long standing feud between the United States and Cuba came to an end. Years of isolation have done nothing to convince the Cuban government to abandon their communist policies. Perhaps the spirit of Madiba can herald a new era in US / Cuban relations to achieve a better life and democracy to this tiny Caribbean island nation. As Nelson Mandela showed the world, great things can be achieved when leaders and people are able to openly discuss their differences, come to an agreement on the way forward. President Obama's rousing eulogy will long be remembered. His words rang with the spirit of Madiba, a great tribute to our great leader.